Today I want to introduce you to Karen Kilby. Karen is currently an Associate Professor of Systematic Theology here at Nottingham, but has recently been appointed to the Bede Chair of Catholic Studies at the University of Durham. A post which she will take up in January 2014. Karen was born and raised in Connecticut and did Mathematics and Religious Studies as an undergraduate at Yale. She then went to work at Cambridge, returning to Yale to do her PhD under George Lindbeck and Kathryn Tanner. David Kelsey, Nicholas Wolterstorff, George Lindbeck and Kathryn Tanner. 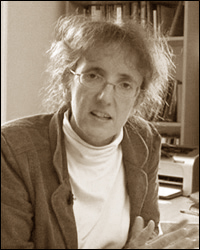 Karen’s work includes focus on specific modern theologians, especially Karl Rahner and Hans Urs von Balthasar, as well as systematic theology (she has taught courses on the Trinity and on Christology) as well as more theory based theology (Liberation theology, Feminist theology, etc.) Karen’s approach to systematics tends to be historical, that is she is interested in showing how doctrines developed. Karen is also interested in the interplay between mathematics and theology. Karen sadly does not have a full bibliography listed on the University’s Website, but below are some key texts she has written. Balthasar: A (Very) Critical Introduction. Wm. B. Eerdmans Publishing Company, 2012. Karl Rahner: A Brief Introduction, SPCK Publishing, 2007. Karl Rahner: Theology and Philosophy, Routledge, 2004. Why Study Systematic Theology at the University of Nottingham? Why Study The Proslogion of St Anselm? Why Study Hans Urs von Balthasar? I hope you’ve enjoyed Karen’s videos. If you find yourself wanting to know more, make sure to check out any of Karen’s books, they’re all of reasonable length and quite readable. Also, be on the look out for more work by Karen as she takes up her new, and well deserved, post at Durham. Today, for Western Christians, is Trinity Sunday. Today we set aside some time to contemplate a God that is both 1 and 3. This is terribly difficult understand. Since God is completely other than us, we can never come to full knowledge of him in his essence. Nevertheless, God has revealed himself to us and he has done so in three persons who are one. There are many heresies surrounding the notion of the Trinity. There are some who want to deny Christ’s divinity (and implicitly the Spirit’s as well); there are some who accept the Son’s divinity, but deny the Spirit’s; there are some who deny that there are three persons at all, but only one who shows himself to us in three different ways. As many heresies as there are surrounding the Trinity, there are as many if not more analogies that attempt to explain it. While I think it good to try to understand God as Trinity, today, the key is worship the great mystery that is our God. That being said, below you will find two videos on the Trinity. In the first, Dr Karen Kilby talks about a particular, modern analogy of the Trinity and her hesitancy about it. In the second, you will why using any analogy breaks down in the end. May you find yourself in awe of the Trinity today, and away from incredibly difficult Irish snake farmers. One of my favourite Christmas presents from this last Christmas was a reproduction of an icon given to me by my Mother-in-law. Icons are another one of those things that tend to confuse Western Christians, particularly we lower-Protestants. They can seem like idols. They can be treated like idols. There are even passages in Scripture that tell us not to make graven images of our God. So why on earth do I have a reproduction of an icon of the Trinity? The answer is less than simple and I certainly don’t claim to have all the answers. At root, however, the logic behind icons is that Jesus, who is the Image of the invisible God did precisely what graven images in Exodus were intended to do, he gave us a picture, a physical object in himself, to show us what God is like. This became the main argumentation in the early Church for creating (or writing as it is now called) icons. Since Christ gave us an image of God to guide us to God, it is not inappropriate for us to create images of God to help guide us to God. The purpose of an icon is a guide. When you pray using an icon, you are not praying to the icon, instead you allowing the image depicted in the icon lead you to deeper truths about God. This can help you focus your prayer when you don’t know what to pray. While many icons depict Jesus (or God as the icon of the Trinity above, which is actually a depiction of the three visitors who come to Abraham before destroying Sodom and Gomorrah), there are also some that depict holy people. I don’t want to get in to this, since this leads us to the veneration of saints, but the idea behind these icons is still one of guidance and seeking for personal transformation. We pray to God (not the icon) that we may be made more like the person depicted (These icons are also used to invoke the saints themselves and ask them to pray for us, just as we would ask our friends. I realise that many may still have issues with this, but I wish only to focus on these icons as guides). Below I’ve embedded a video from one of my supervisors, Dr Mary Cunningham, on why theologians ought to study icons. Give it a watch. At the end of the day we are called to pray without ceasing. Sometimes, however, we need help, we need guides because we do not know how to pray. While the Holy Spirit will groan within us and for us when we don’t know what to pray, we can still use other guides. This is the usefulness of icons in prayer.